360 King Spinner Complete -- Urethane 360 Wheels - Double kick, concave, symmetrical/bi-directional shape 28 3/4" x 7 3/4" Wheelbase 13"
NEW graphic & colorway in the house! Ships ready to ride out of the box -- with premium parts and expert set-up --- specifically dialed for spinning by the 360 King himself! 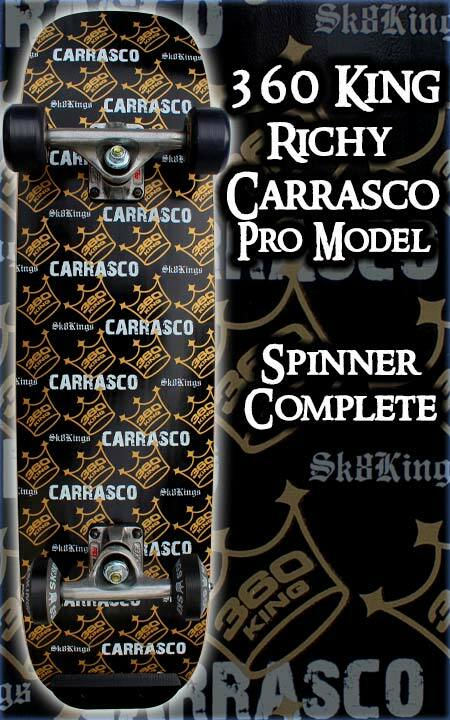 DECK SPECS: Overall dimensions: 28 3/4" x 7 3/4" Wheelbase 13" in 7-ply hard rock maple and screened with full deck signature 360 King Crown logo graphic in new black gold colorway. Deck details here: 360 King Deck. Ships with FREE stickers and collectible 360 King Photo Flyers. UPGRADES: Truck Extras -- Kingpins & Bushing Caps: Tired of breaking your kingpins? Upgrade to stainless steel. We remove the stock kingpin from the truck and replace with a super strong stainless steel kingpin. For extra bushing stability and to eliminate performance robbing bushing bulge we can add the specially designed Oust Aluminum Bushing Caps to your trucks. Oust Bearings: Upgrade to Oust Moc 5 Bearings. Add Nose Skid Plate: Add a King Plate II to the nose of your spinning rig (tail skid plate already included). Oust Bearing Care: Add a bottle of Oust Metol Speed Lube - to keep your bearings lubed and ready to roll. The Oust Speed Kleen Bearing Wash Kit is also recommended for periodic thorough cleaning of your bearing set. Add either or choose the "both" and save a couple bucks. Logo Tee/Hoodie/Hat: Save $5 on a logo T-shirt, Hoodie or Hat when ordered with a deck or complete. Choose the item to add and indicate logo choice and size in the notes section when ordering.